And I’m so far behind on LJ it ain’t funny. Well, it didn’t go as planned. For years, I’ve simply picked up the tickets for the Saturday for #NYCC at local comic shops. This year, well, I called and they sold out about ten minutes after they opened, which left me and my friend going ‘uh…’ So I looked at what was left – Friday or Sunday. Sunday is kids day and that made me go “eeuuuu”. No offense to children, but hundreds of them all over the place ‘wanting’ stuff might drive me nuts, so I ordered Friday tickets. This must have been pre-ordained cuz when the schedule came out, I found out that David Hewlett (@dhewlett) had a panel that night and only that night. It was meant to be. We caught the local early train into the city, sorta. Well, we got dropped off at the station and about five minutes before the train was to arrive, it’s announced the train broke down. We’ll have to wait for the next train. Gah. So we do, then when that train is to arrive, they announce it will be 10-15 minutes later (translation: another half hour). This got us into NYC over an hour later, so when we got to Grand Central and went outside to catch the official #NYCC bus, there was a friggin’ line of about 100 people! ARGH! We finally got on a bus and arrived and when we got there, the con had already opened (we’d never arrived AFTER the con had opened before). However, we were not stuck in the horrendous hordes of folks trying to get in (due to new RFID cards, each of which had to be scanned). My friend is disabled so we went through the handicapped/press area, of which there were definitely not as many. The con was PACKED. I heard the fire department cleared part of the autograph lines for Stan Lee on Saturday due to the big crush of folks wanting his autograph. I got off the bus a little after 10am and finally actually sat down after 4pm, so literally spent virtually of the day on my feet. I don’t buy much, really (if I’d the $450M mega millions, then I would buy tons of stuff!) 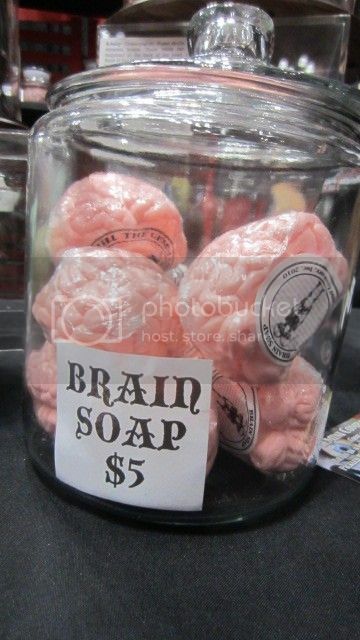 so got a soap brain (just because it was there) and two t-shirts. I spent the day just checking out the dealers room and finally, the David Hewlett “State of Syn” panel, although sat through the ‘beer in scifi” panel to get a decent seat. They passed out beer. Alas, I was on the less aggressive side of the room so the other side drank up all the beer. Meanwhile, when David’s panel started, they were staring at a box full of empty bottles on the table and one guy grumbled “gee, someone oughta tweet about this!”. 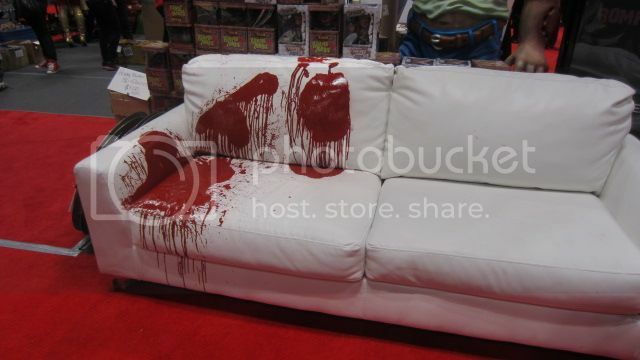 The panel was a lot of fun, and afterwards, I gave David a miniscule gift (what I called the “possessed porpoise”). It’s a tiny keychain of a porpoise, you press a button, its eyes light up BRIGHT and it makes a scary scream. David was rather pleased as apparently his son had one but wrecked it so this was a replacement, although I told him he could keep it if he wanted to. Also got a snapshot with him. Cool! We did manage to catch a cab back to Grand Central (which is tough around the Javitts Center at 9pm!) All in all it was a lot of fun, and did run into a fan I’d known from the War of the Worlds day. She had a 4-day VIP membership (wish I could afford that!). Oh oh, did get to meet John Barrowman (Captain Jack from “Torchwood”) and that was fun. He had a HUGE autograph line, which I did just so I could say ‘hi’ and get an autograph and pass on a photo of three of his die-hard fans (whom I’ve known for years) to him. We’ve come to realize that should it be feasible next year, we’ll get three-day tickets and then do at least two days, cuz you can’t do the con in one day anymore. It’s just too big now! 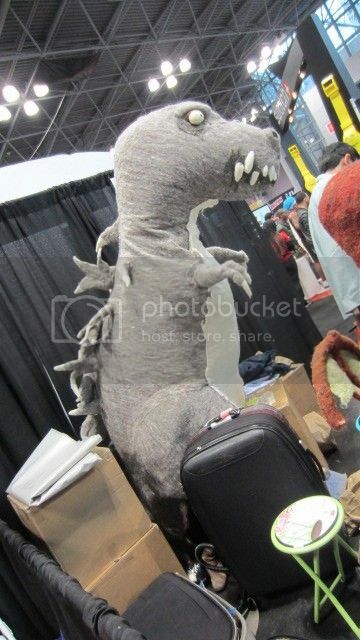 This dinosaur was made totally from wool. No joke. 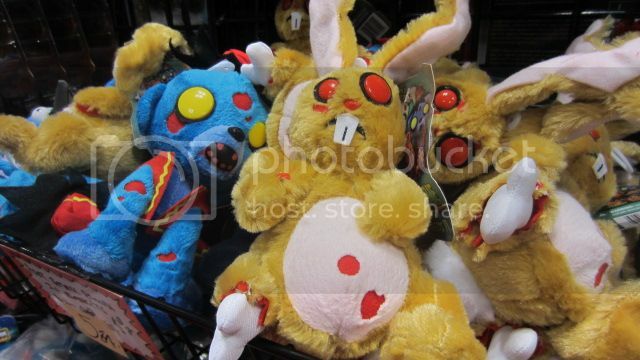 They sold kits to make critters out of wool. 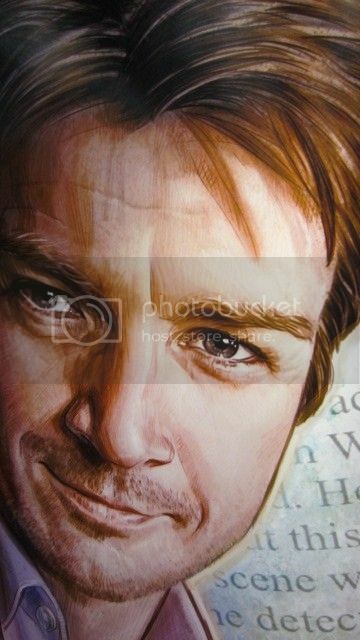 This was a big poster of Nathan Fillion. 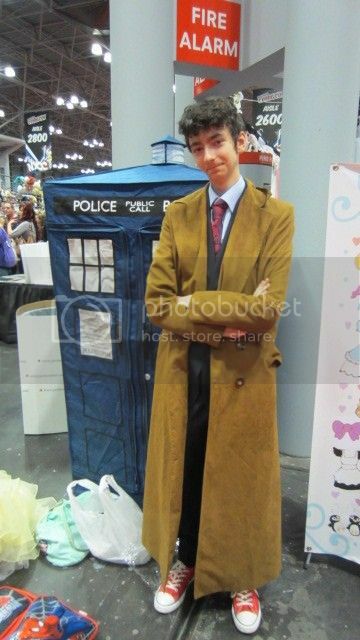 This Doctor Who was at last year's NYCC as well. 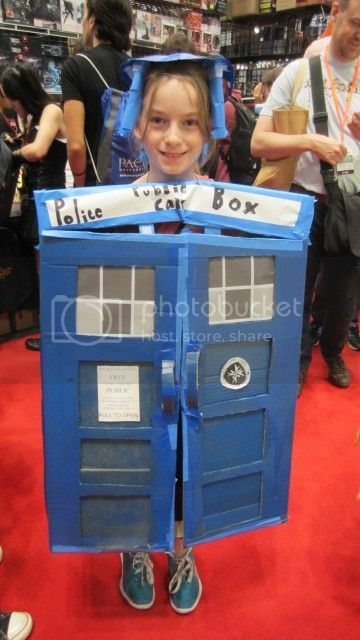 He comes with his own portable Tardis and seemed quite happy when I went "Oh hey, you were here last year too, want to pose for a picture?" Hope he's there next year. They were scented so I was um, er, I don't know, but then I circled back (fought the hordes of fans and circled and circled until Ifound the booth again) and bought a green one. I have yet to crack it open as it looks so pretty. 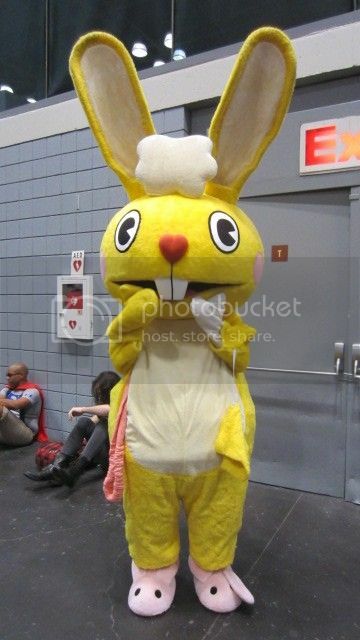 I have no idea what this critter is from (anime?) but it was sooooo cute. 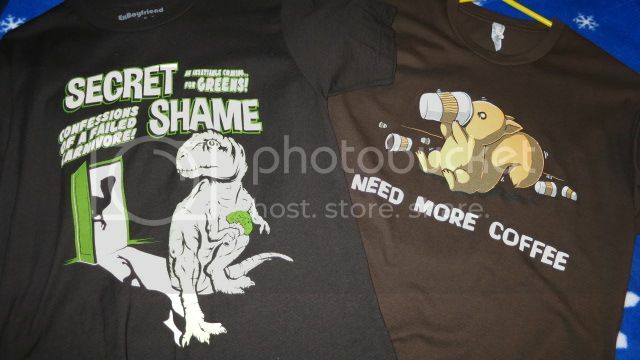 I could not resist buying these t-shirts. Of course it's too cold to wear them. I'm bundling up in fleece until Spring. When TV viewing goes bad. I can't recall what this was for, but tons of people posed on it. Amazing I got it sans people on it! 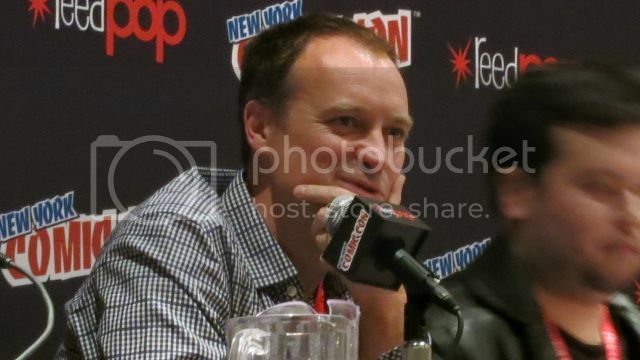 And lastly, David Hewlett at the State of Syn panel. It was so neat to see him at the con, and to meet him afterwards. And that's it for this report. Next, well, soon, Halloween, then Thanksgiving (nah, forget it, we ate a turkey, nothing much to talk about) but Halloween. Time to deck the Dalek!